Gledhow Hall is now private flats, retaining many original period features including a stained glass ceiling in one of the properties, as well as ornamental tiled floors, fireplaces and columns. 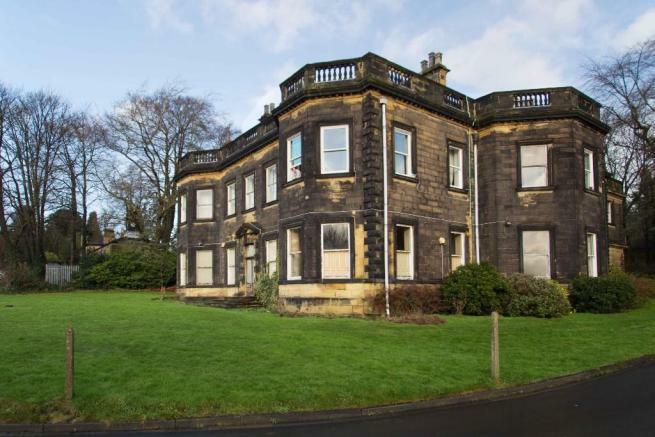 House and Heritage features a guest post from Michael E. Reed on the history of Gledhow Hall, Leeds, and its Royal connections. Michael E. Reed (b.1964) studied Art History at Monash University in Melbourne, Australia. He has taught English, History, Music and Drama at various Melbourne colleges for many years and has worked as a performer – particularly in theatre, opera and as a band singer. Reed has written for the UK Guardian regarding the Duchess of Cambridge’s family connections with art and architecture. He has worked as a researcher for other leading UK newspapers including the Telegraph, the Express and the Daily Mail. Reed lives in Melbourne in an Arts and Crafts house with his wife and daughter. Gledhow Hall, in Leeds, is still standing sentinel and today houses several luxury flats. Yet few are aware that the Hall and the Gledhow area itself is intrinsically linked with the family of Kate Middleton, the Duchess of Cambridge. Gledhow Hall is on Gledhow Lane at its junction with Gledhow Wood Road. The land was originally monastic and was purchased from Queen Elizabeth I by the Thwaites family. Several notable Yorkshire families have owned the Hall, including the Becketts, the Benyons, the Dixons and the Coopers. The Hall, as seen today, was completed shortly after 1766, by York architect John Carr who had been responsible for Harewood House – the home of Princess Mary, Countess of Harewood, whose niece is Queen Elizabeth II. Gledhow Hall – the work of architect John Carr of York. Between 1812 and 1815, J.M.W. 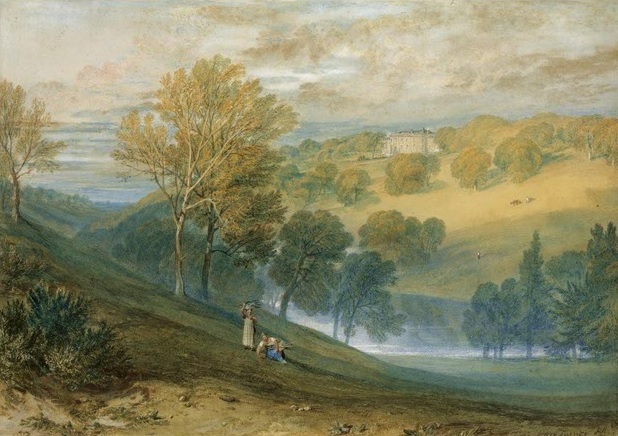 Turner sketched the view of Gledhow Hall from across the valley and made a painting. Turner’s painting was inherited by Guy Kitson Nevett, the great grandson of James Kitson who purchased Gledhow Hall in 1885. Joseph Mallord William Turner’s watercolour painting of Gledhow Hall c1816. James Kitson was created a baronet in 1886. He was the 1st Lord Mayor of Leeds in 1895 and would be raised to the peerage as Lord Airedale in 1907. When Kitson acquired the Gledhow Hall Estate, some of the land had previously been sold to William Hey who had built the neighbouring Gledhow Wood Estate circa 1860. The Middleton family connection begins in 1875 when the Gledhow Wood Estate was purchased by German nobleman – Edward, Baron von Schunck – who had married Kate Lupton in 1867. Kate – the daughter of a former Mayor of Leeds – had grown up nearby at her family’s Potternewton Hall Estate, as had her first cousin, Francis Martineau Lupton and his daughter, Olive Middleton who was the great grandmother of Kate Middleton. Olive Middleton. Kate Middleton’s great grandmother. In 1890 at Gledhow Wood, Baron von Schunck’s wife hosted the wedding breakfast for her daughter, Florence, and her new son-in-law, Albert Kitson. A prestigious event, Olive’s family were reported as being guests at the wedding; so too, was Herbert Gladstone (later Viscount Gladstone), the prime minister’s son. The great prime minister himself, Gladstone, had also been a visitor to Gledhow Hall. On March 16, 1911 Albert Kitson inherited the title 2nd Lord Airedale and took ownership of Gledhow Hall. Given that his mother-in-law, Baroness von Schunck, was residing at the adjacent Gledhow Wood Estate, the two estates were re-united as a grand family seat. Lord and Lady Airedale were invited to pay homage at Westminster Abbey to King George V at his coronation in June 1911. Lady Airedale’s mother, Baroness von Schunck (née Kate Lupton), was also invited. A wealthy woman with a keen interest in the educational provision for women, Baroness von Schunck is listed in Burke’s Peerage Second World War Edition as having died in 1913. The Yorkshire Post and Leeds Intelligencer reported that amongst her chief mourners were members of Olive Middleton’s family. Olive Middleton’s cousin Lady Airedale and her husband Lord Airedale at the 1911 coronation of George V.
In 1914, Olive married solicitor Richard Noel Middleton whose grandfather – solicitor William Middleton – had founded the Leeds firm of solicitors, William Middleton and Sons. 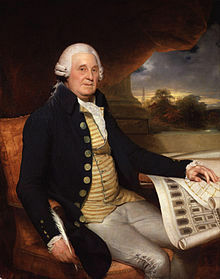 A gentleman farmer, William Middleton Esq. had also lived in the area at Gledhow Grange Estate. Gledhow Hall V.A.D. nurses – Olive Middleton on far right with her cousin, the Hon. Doris Kitson, centre row, third from left. World War I saw Gledhow Hall being offered by the 2nd Lord Airedale for use as a VAD hospital. Lord and Lady Airedale’s daughter, The Hon. Doris Kitson, was photographed working at her home as a volunteer nurse in 1916; she was mirroring the war efforts of her cousin Olive Middleton – also photographed as a volunteer nurse at Gledhow Hall. Familial ties were strong and we find that Olive’s sister-in-law, VAD nurse Miss Gertrude Middleton, was similarly photographed at Gledhow Hall. A talented pianist, the Gledhow Hall Concert Programme records Gertrude Middleton as being an accompanist at concerts held at her relative’s grand home. As second cousins, Baroness Airedale and Olive Middleton shared much: apart from their Unitarian faith, both women and their families were much involved with charity work which concerned nursing, social and educational matters. They have no doubt inspired their descendant, the Duchess of Cambridge. 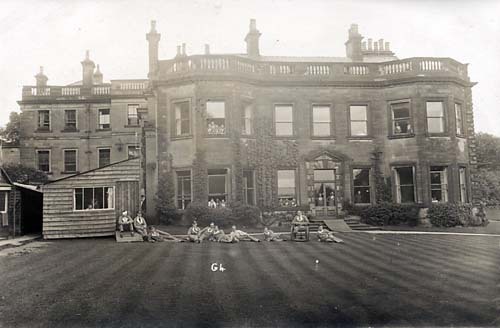 Gledhow Hall as a VAD hospital with patients convalescing on lawns. Tragically, all three of Olive Middleton’s brothers were killed in World War I. Various memorials are found to honour the brothers at the Leeds Mill Hill Chapel, Trinity College Chapel, Cambridge and St. John’s Church, Roundhay. 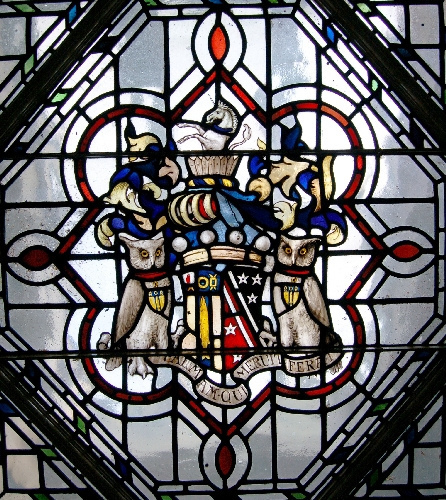 Coat of arms of Baron Airedale as seen above the stairwell at Gledhow Hall. By 1923, Gledhow Hall had come into the possession of the City of Leeds. Noel Middleton died in 1951, his wife Olive having passed away in 1936. 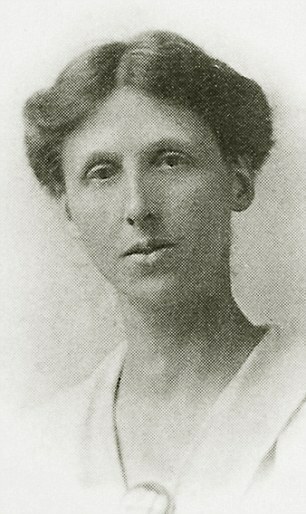 Baroness Airedale died in 1942. Gledhow Hall reminds us that a manor house can hold memories both celebratory and glamorous in nature yet also contain within its walls stories of enormous human heartbreak.